Amendment - Just got back from a dog walk where I quickly had a few chucks with the Z-Man/weedless hook with hitchhiker setup which is described in more detail below - it doesn’t work. The Z-Man looks stunning in the water when you swim it nice and shallow, but the moment I put any power into the cast and the hitchhiker popped out of the front of the lure - because of the material I guess it’s not actually “catching” into the soft plastic. It’s going to work though, I just need to find another hook to get this thing swimming shallow. 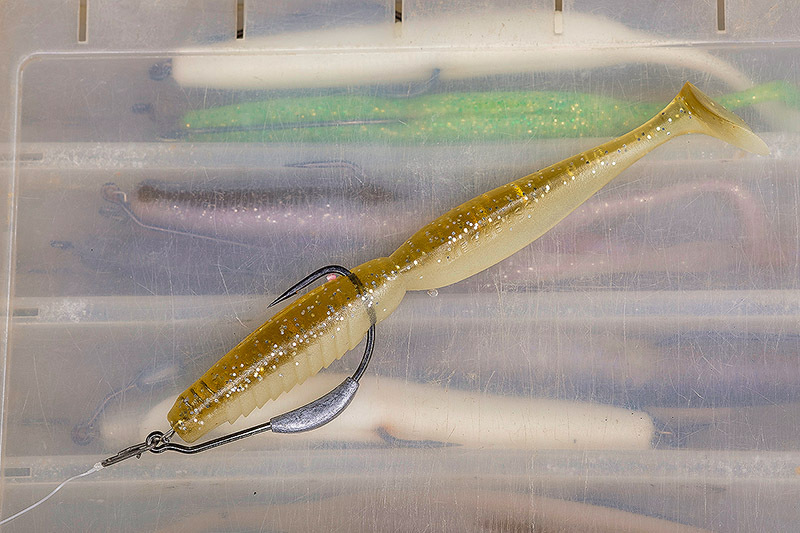 Perhaps the TT Lures ChinlockZ, and then add some lead strip to act as a belly weight? More to come. So I briefly mentioned the other day that during this week of charging around Cornwall and generally fishing our socks off how Steve had been doing well on the 5’’ MegaBass Spindle Worm fished on a 4/0 Gamakatsu Worm EWG Weighted Spring Lock hook with the 3.5g belly-weight - and naturally it has got me thinking a whole lot more. For sure I have swum various paddletails nice and shallow for bass a fair bit before - and with a good degree of success - but for whatever reason I kinda moved away from it as I tried other stuff. Which of course is one of the dangers I suppose of striving to learn all the time and expand your armoury as such - you can sometimes almost forget a method that you used to use, but then that is also the beauty of fishing with other anglers. We are naturally going to fish in slightly different ways and sure enough somebody is going to do something that strikes a chord with you. If you bass fish from the shore with lures then I would guess you’re fishing a lot of shallow, reefy ground where the water can sometimes fizz around a bit, and to me it makes so much sense to swim certain paddletails nice and shallow and for the most part fairly slowly, indeed Steve had a few bass last week by literally holding his lure in the backwash or small rips created by the fizzing sea. Obviously I went and bought a few packets of those 5’’ long MegaBass Spindle Worm paddletails - it’s not as if I need much encouragement to drop some dosh on lures after all! 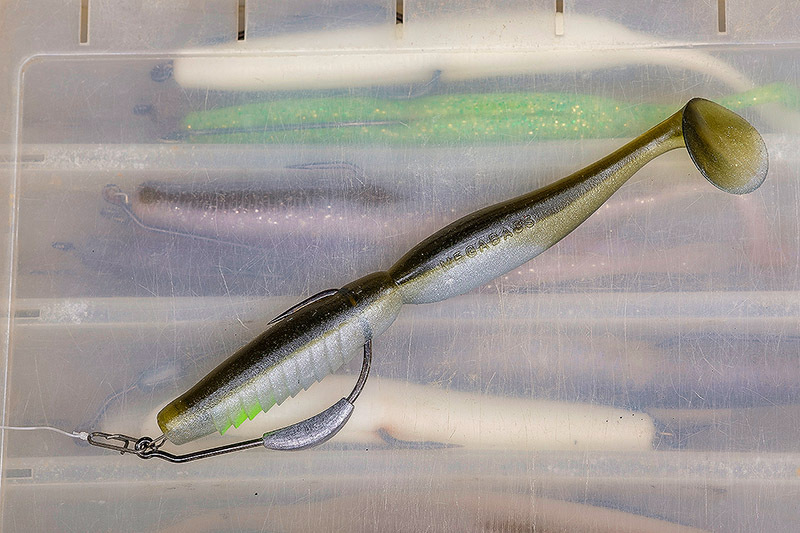 I have various weedless hooks here with belly weights on them already - and if it helps, I have used and really like the Owner and VMC ones, but I can’t get away from how well those Gamakatsu ones sit on the Spindle Worm as well. I must have bought some a few years ago because I found a couple of packets of them squirrelled away here in my office. And blow me down if I didn’t go and find another stunning looking paddletail that I completely forgot I had here, and as per the photo above it looks pretty damn tasty rigged on a belly-weighted weedless hook. I have used some of the almost ridiculously long lasting ZMan soft plastics a lot for wrasse fishing, and whilst you need to keep them in their packets and separate from your other soft lures and they can be a little awkward to rig, to me they are more than worth it with how lethal they are for the wrasse. Anyway, so I stumble upon this packet of Z-Man Grass KickerZ 5'' paddletails and I start wondering how nice they must surely be swum nice and shallow for bass. I realise very quickly that because of the weird plastic the lures are made from I can’t simply wind a hitchhiker on a weedless hook into the front of the lure, and then because we can these days, I go looking for help on YouTube and I found the video above. Sorted, and rigged with a VMC Drop Dead Weighted Weedless Twist 3.5g (belly weight) 5/0, the combination weighs 16.2g - and bear in mind that for whatever reason these VMC Drop Dead Weighted weedless hooks are big, and this 5/0 as per the photo is far more like a regular 6/0 if you ask me. Nice hooks though. I am really looking forward to giving this combination some water time, and I also like how the Z-Man soft plastics aren’t very expensive at all when you also factor in how long they last compared to other soft lures. There are of course loads of options out there for lures like these. I found an old blog post from mine that refers to catching on the Yamamoto Swim Senko for example, a paddletail that some mates in Ireland put me onto a few years ago. And of course these paddletails can be fished nice and slow without any belly weight on the hook in calm conditions, although I don’t yet know how the very buoyant Z-Man Grass KickerZ 5'' paddletail might swim like this. A tip that I picked up from John Quinlan over in Ireland was to carry a few thin strips of lead to wrap around a weedless hook if you needed to add some weight and/or don’t have any belly-weighted weedless hooks to hand. And so on. A simple way of bass fishing that I find myself very excited to almost come back to and learn far more about, and to me it’s an option to turn to especially when the conditions might be a touch too fizzed up to properly control something like a 6’’ DoLive Stick rigged weedless and weightless. I mentioned John Quinlan and his lead strip thing earlier, so I am really pleased to see my interview with him in this month’s Sea Angler magazine. He is a blast to work with on this co-guiding stuff we do together over in SW Ireland, and it was great to finally find a bit of time to sit him down and fire a few questions at him. Professionally guiding as he does and has done for so long now doesn’t half give you some interesting insights into fishing.